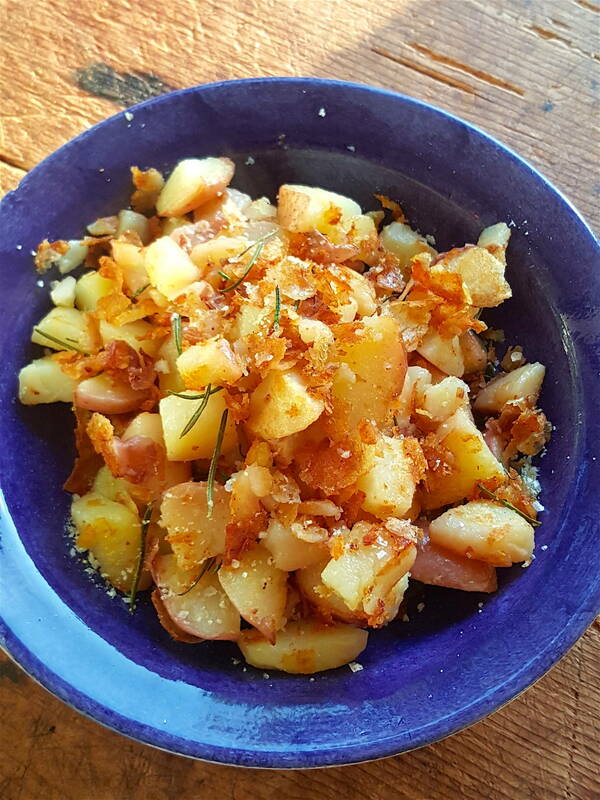 Crispy potatoes – it's hard to resist all those crunchy golden flakes! Don't peel these spuds – the skins sizzle up and add crunch (and goodness). 1 Wash the potatoes and put them in a steaming basket. Sprinkle with salt and steam until tender (if you don’t have a steamer, boil in the usual way but don’t overcook them). When the potatoes are nearly tender, remove steaming basket from the steamer and drape potatoes with paper towels. Cool (or cool and refrigerate for the following day – see notes below). 2 Slice potatoes thickly. Heat the oil in a large pan (skillet) over a medium heat. Drop in the butter. Once it is sizzling, add the potatoes, and any crumbly bits or pieces of potato skin (the skin crisps up nicely). Cook potatoes until golden, turning often with a palette knife. Season well with flaky sea salt and add a little rosemary. In the picture I have added the leaves whole but I should know better because they turn tough and spiky; it is better to use chopped rosemary. 3 And that’s it! Serve with fried eggs and salad, or take the pan outside, sit somewhere private and eat the whole lot yourself. The best way to store steamed or boiled potatoes is to put them in a container lined with paper towels, and to drape with more paper towels. This absorbs moisture and stops them from becoming slimy. They will keep for a 2-3 days refrigerated. Hi, great recipe and hints… a must try. Thanks Brenda. Glad you enjoy the recipes on Shared Kitchen. That whiff of barbecue smoke brings them running ... though these succulent treats can be prepared indoors in a grill pan any time of year.